but there was thing that eluded me. 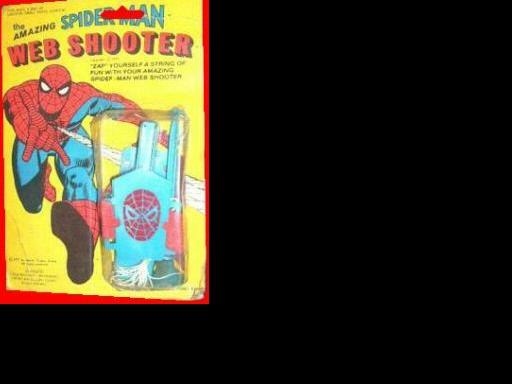 I wanted it more than most anything else during an intense period of Spider-Man worship – I needed the web shooter toy, but alas, I never got it, and neither did anyone else I knew, though I recall either ads in comics or even on the television of the time (more likely to be press ads though??). I know it does not look much in its packaging, but that cheap little glove and firing mechanism was my Holy Grail in the late seventies. There is not a lot of information out there on the toy – like who produced it, how much it cost, when it was available (was it out in the UK???). If there is anyone else out there who has been affected by the subject matter of this post – get in touch. Don’t suffer in silence. Let us try and pool our meagre collective memories on this most fleeting and elusive of Superhero merchandise.